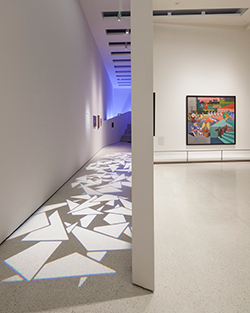 Solomon R. Guggenheim Museum, New York, February 21–September 1, 2014. Photography by Kris McKay © SRGF. So, what about those young children, sitting on the floor of the Guggenheim Museum, learning about Futurism by moving black shapes around on construction paper? Aren’t these children doing exactly the opposite of what Marinetti envisioned for his glorious new civilization? 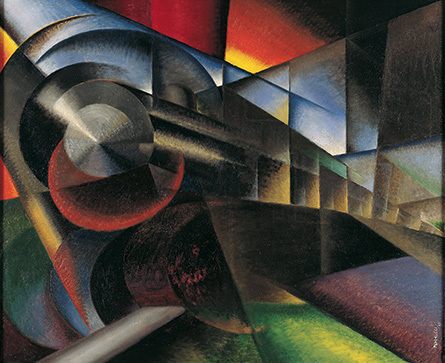 Let’s look at a typical painting from the first period of Futurism, Ivo Pannaggi’s “Speeding Train” from 1922. 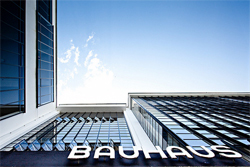 Here is what we expect from Futurism. The love of speed. The love of machines. The love of bold shapes and color. The painting is also an attempt to solve a not-insignificant problem. Images captured by means of applying paint to canvas are inherently static affairs. 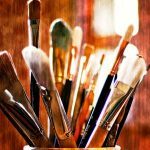 That is to say, it’s difficult to get motion into a painting. It is even more difficult to capture speed. 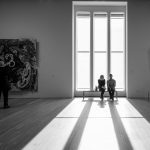 Pannaggi solves the problem by breaking up the canvas into a number of intersecting planes that create lines or rays moving from the center of the painting out to the edges of the canvas. He uses intersecting circles and hemispheres to capture a sense of the rotating wheels and gears of the train. And he uses color boldly, with sharp contrasts set one against the other—a patch of red, for instance, right against a patch of blue. The net effect is, more or less, one of speed and motion. “Speeding Train (Treno in corsa),” Ivo Pannaggi (1922), Fondazione Carima–Museo Palazzo Ricci, Macerata, Italy. Photo courtesy Fondazione Cassa di risparmio della Provincia di Macerata. But the more you look at the painting, the more it looks familiar. If you didn’t know that “Speeding Train” was a work of Futurism, you might think that it was the painting of some hitherto-unknown Cubist. You might think, “This artist looked at some of the paintings of Braque and early Picasso and decided to apply Cubist principles to the specific problem of painting a moving train.” You might further notice that the intersecting planes and the geometric shapes to be found in “Speeding Train” are vaguely reminiscent of the still lifes and landscapes of Cézanne. It wouldn’t be crazy to think this, since there is a direct lineage from Cézanne to the analytical and geometric experiments of Cubism. It was Cézanne, after all, who decided that painting could be an act of analysis, that a painting could show us the deeper Platonic truths of shape and form that can be found lurking within our visual field. And that is what Pannaggi seemed to be doing, too. He broke the speeding train down into primal elements: square, plane, circle, red, line, blue, ray, cone, hemisphere. The children sitting on the floor of the Guggenheim, playing with the arrangement of basic shapes, were therefore doing a childish version of what Pannaggi did in his painting of a moving train. Futurists like Pannaggi may have been trying to break civilization wide open. They may have declared a new age of speed and violence and radical newness. But as soon as they attempted to analyze that newness, as soon as they attempted to say something about their brave new world, they found themselves pulled back into history and tradition. Pannaggi wanted to show us that modern machines are unlike anything we’ve ever seen or experienced before. Then he created a painting that doesn’t look radically different from Cézanne’s paintings of Mont Sainte-Victoire, a mountain that has existed since before the dawn of the human species. Pannaggi wanted to paint the very essence of speed in the machine age. His painting, with its basic geometrical shapes, looks like a study in Platonic solids that could have come from the early Renaissance; something, maybe, by Paolo Uccello. This inability truly to break out of the old ways must have been frustrating for the Futurists. Newness, it turns out, is a trap. That is one of the essential discoveries of Futurism. Futurism was not the first movement to discover this trap. But the trap of newness is no less important for being discovered and rediscovered over the ages. That is part of the trap, after all. You rediscover something that has already been multiply rediscovered. What seemed brand-new at first, turns out, on further reflection, to be ancient. Amusingly, perhaps maddeningly, you can scratch the surface of any work of Futurism and the past comes rushing back in. 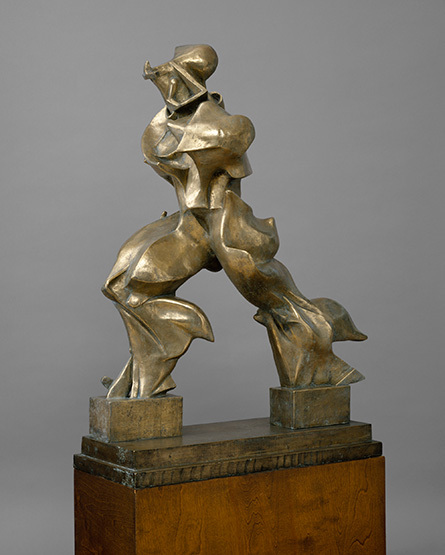 Take Umberto Boccioni’s Futurist sculpture, “Unique Forms of Continuity in Space.” Boccioni’s work is to sculpture what Pannaggi’s “Speeding Train” is to painting. It is the attempt to make a solid, motionless piece of cast bronze into something that is fluid in space and time. Boccioni achieves this by breaking up the surfaces of a human figure. That’s to say, he sculpts a person in several moments of motion all at once. Look, especially, at the legs of the figure. The legs are thick because Boccioni is showing us multiple positions of a moving leg. It is as if Boccioni took a series of photographs of a person striding forward, spliced those photographs together, and then made a sculpture of the result. The sculpture does not freeze a moment into sculptural eternity, as a more traditional sculpture might do. Instead, it shows us that form is never frozen, but always in transition from one state to another. That’s an essentially Futurist thought — all the emphasis is on dynamism, with little regard for the fixed state. “Unique Forms of Continuity in Space (Forme uniche della continuità nello spazio),” Umberto Boccioni, 1913 (cast 1949). The Metropolitan Museum of Art, New York, Bequest of Lydia Winston Malbin, 1989. © The Metropolitan Museum of Art. Photo courtesy Art Resource, New York. But the problem with Boccioni’s sculpture is that, though it may suggest movement, as a sculpture, it is still in a fixed state. It may express dynamism, but it does so in static — one almost wants to say classical — form. Indeed, as has been noticed before, “Unique Forms of Continuity in Space” resembles the classical sculpture, “Winged Victory of Samothrace.” You’ll recall that “Winged Victory of Samothrace” was the very sculpture that Marinetti referred to in his Manifesto. Marinetti claimed that the roaring motorcar was more beautiful than the “Winged Victory of Samothrace.” This was his way of rejecting past notions of beauty in the name of the resolutely modern. But Boccioni’s sculpture is beautiful partly because of what it shares, formally and historically, with the “Winged Victory of Samothrace.” Boccioni’s sculpture does not resemble an automobile; it resembles a stone statue from ancient times. Boccioni and the sculptor of “Winged Victory” share the assumption that there is something essentially compelling about the movement of human bodies. When a human being strides forward, the rest of us pause to take a look. The lyrical quality in “Unique Forms of Continuity in Space” would have been beautiful to a citizen of 2nd century Hellenistic society, just as it is to someone wandering through the Guggenheim in the early 21st century. Indeed, the more one looks at Futurist art, the more one suspects sleight of hand. Maybe the claim to radical newness was not so much a trap as a conscious or semi-conscious ploy. In this, Futurism was a fascist movement all the way to its core. That’s to say, Futurism and fascism were both about restoring order in a disordered world. The Guggenheim exhibit, by the way, is perfectly open about the fascism of Italian Futurism. There is no point in denying it. Most of the Italian Futurists, Marinetti most of all, were enthusiastic fascists. You can seek to explain this away, as has often been done in the past, or make the claim that Futurism was aesthetically important despite its political allegiance to fascism. The problem with the latter claim is that Futurism is aesthetically interesting insofar as, aesthetically, it refuses to accept boundaries between art and politics, or between art and life, or art and anything else. So, to claim that Futurism is aesthetically interesting although politically repellent is to misunderstand and ignore the very point and purpose of Futurist aesthetics. The Futurists wanted their art to impact life and they wanted that impact to be fascist in nature. In saying “yes,” in asking for more, they discovered a secret source of power. It was a way forward. By choosing to embrace the most terrible aspects of the war and the industrial civilization that had made it possible, the Futurists gave themselves a kind of immunity from the paralysis that European civilization experienced after the war. This was a significant discovery. The next thing the Futurists discovered was that once you’ve expressed enthusiasm in response to war and the machine age, you can go about repairing your civilization’s ties to the past under the protection of that enthusiasm.